Amerejuve MedSpa and Cosmetic Surgery has acquired R U Hairy, a Houston fixture for affordable, quality laser hair removal. R U Hairy clients will now have access to all ten Amerejuve locations in the Houston area and many services in addition to laser hair removal. The RU Hairy clinic at Westheimer and Dunvale joins the Amerejuve family. This an important and exciting milestone in Amerejuve's journey. We are looking forward to welcoming the 2,500 clients of R U Hairy to the 25,000 plus members of the Amerejuve family. Amerejuve MedSpa and Cosmetic Surgery has acquired R U Hairy, a Houston fixture known for affordable, quality laser hair removal. The R U Hairy location, located at 8401 Westheimer Rd Ste 260 at the intersection with Dunvale, is Amerejuve’s 10th Houston location. All R U Hairy clients will have their previous purchases honored, and R U Hairy manager Angelita Robles said many of them are pleased with the transition. R U Hairy will soon offer the full menu of Amerejuve services in addition to laser hair removal, including injectables such as Botox and Dysport, body contouring such as CoolSculpting and Vaser Shape, skin rejuvenation, and others. Robles said clients can expect the same great level of service they’ve gotten from R U Hairy for years with laser hair removal, now with a wider variety of aesthetic services as it joins Amerejuve’s mission to help others look good and feel good. Robles has been in the aesthetics industry for 15 years, and she’s seen the industry change for the better in that time. “I’ve seen it grow from where it was just massage and facials and a hair salon to the medical end getting involved,” she said. Robles said she’s particularly excited about the opportunities when medspas and cosmetic surgeons work together, as Amerejuve does with their team of surgeons and aesthetic technicians. “It gives the clients more personal attention for pre and post-care of any procedure,” she said. 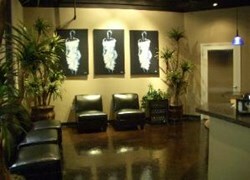 Naghavi noted that Amerejuve is a leader in the medspa industry in Houston. “Amerejuve stands for American Rejuvenation Centers and strives to provide cutting edge esthetic and wellness services,” he said.